The historiography on the relationship between Muslims, the Russian Empire, and then the Soviet Union has become a cottage industry in Eurasian historical studies. A slew of books have come out in the last five years as researchers think about the reasons for the dissolution of the Russian/Soviet Empire and the state’s relationships with its Muslim subjects/citizens. Both the Chechen War and GWOT have made this interest even timelier. There are too many books to list, and frankly my knowledge of this burgeoning topic is not as good as it should be. And that is more the reason to start putting my ear to the street and note new studies on the subject. First, for those who have access to academic journals, I point you to the Summer 2006 issue of the Slavic Review (vol. 65, no. 2). This issue features a forum called “The Multiethnic Soviet Union in Comparative Perspective.” Adeeb Khalid’s comparative essay on the Soviet and Turkish state’s relations with its ethnic groups and the applicability of postcolonial analysis is worth a read. 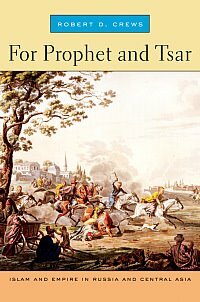 Sounds like a fascinating study and not just because it challenges our standard view of the relationship between empire and subject; it also gives us a better picture of the intersection of religion and modern practices of state efforts to regulate, subjugate, and discipline its populations. I hope to find time to read Crews’ study.